This ebook gives you every line, joke, piece of timing, setup, move, rationale and nuance of the routine. 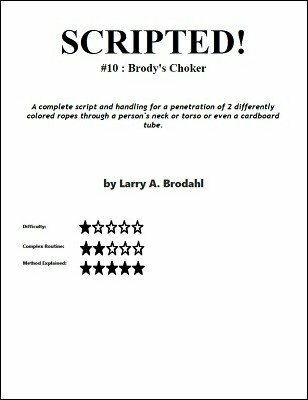 It also takes you through an overview of some of the steps of script writing that were used to create this script, along with alternate methods of preparing the ropes, etc. In it's completed form, the trick does require some assembly, but that should cost less than $20 USD. 1st edition 2017, 43 pages.